Cyanide's goblin-based stealth game out next week. 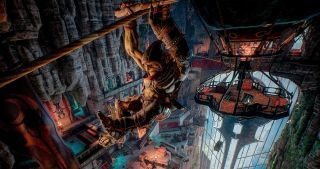 One game that seems destined to be lost in the extraordinary March rush is Styx: Shards of Darkness, Cyanide's sequel to its goblin-based fantasy stealth game that's releasing on March 14—so next Tuesday. The first game garnered fairly solid reviews, and sequel Shards of Darkness seems to offer more wacky, light-hearted, third-person-stealthy shenanigans, but this time with added two-player co-op. Of course, it's not a proper game release without an accompanying 'hey, this is out soon' trailer, and the one Cyanide and publisher Focus Home has put out is...well, it's not your usual launch trailer, I'll give them that. As a YouTube commenter points out, protagonist Styx is basically the goblin version of Deadpool: he makes a crack about Assassin's Creed at one point here, with a zany, fourth-wall-breaking sense of humour that will probably become insufferable five minutes into the game. In short: Styx sounds like a right prick. However, after the deadly serious Dishonored 2, I like that Cyanide's game isn't taking itself entirely seriously.